Below is the Padre Island Rental Guests Rental Agreement. Please read it carefully. These terms and conditions apply to every reservation. Should you have any questions do not hesitate to Contact Us. We look forward to having you stay at one of the many fine properties offered by Padre Island Rentals. Please carefully read the terms and conditions below. By making this reservation and paying either the full rental fee or down payment you are agreeing to abide by these terms and conditions. Padre Island Rentals is the Rental Agent and the name on the reservation is the Guest. This agreement is between the Rental Agent and the Guest. The Guest is responsible for all persons staying in the rented property. A list of all guests staying in the property is required at check-in. This agreement cannot be assigned to another person or guest. Your reservation is for a particular home or condominium. Please review the arrival and departure dates and information about the property carefully. The Guest represents they are a family group as defined by federal fair housing laws. The Rental Agent rents to family groups only. However, some units will allow unchaperoned student or young adult groups, assuming prior arrangements have been made. Those exceptions are only valid if noted in writing on the front of your confirmation. Your reservation is for a specific number of Guests. The maximum occupancy for the property you have rented is clearly stated on your reservation receipt. Local civic and Home Owner Association regulations restrict the number of Guests allowed to stay in condominium properties. The properties rented through Padre Island Rentals and its facilities are for the use of registered guests only and cannot be used for parties, dinners, family re-unions, or other gatherings including persons just visiting for the day that would cause the occupancy limits to be exceeded. A number of condominium properties now require the wearing of wrist bands in order to access the property. There cost of wrist bands has been added to your rental fees. The maximum occupancy of each unit determines the number of wrist bands that may be distributed or sold to Guests. Guests agree to wear the designated wrist band at all times during their stay. Each person issued a wrist band must sign for receipt of the wrist band at check-in. A replacement fee of $50 will charged for lost wrist bands. Parking at most properties is limited. Many properties have space for only one car per condominium unit. Additional cars will need to be parked outside of designated property parking areas. Padre Island Rentals online property information page will tell you how many cars are allowed with the reservation. The online property information will also indicate if additional parking is available for a fee. Most properties do not offer RV, trailer, or boat parking. In many cases, when you arrive at Padre Island Rentals to pick up keys, a parking pass will be issued for each of the vehicles allowed to park in condominium parking areas. For Typical Vacation Rental Stays – The Rental Agent requires a 45-day Notice of Cancellation for the Guest to receive a refund of rental payments. The Guest refund will be less a $150.00 administrative fee. Because incidents necessitating cancellation can occur the Rental Agent offers Travel Insurance through Red Sky Travel Insurance. Red Sky is a third party insurance agency. Claims for canceled trips are made directly to Red Sky. The Sun Trip Preserver offered through Red Sky Insurance reimburses guest’s vacation investment when their vacation is interrupted or cancelled due to covered unforeseen events like sickness, accidental injury, jury duty, natural disaster, traffic accident, military leave revocation, job loss, road closure, mandatory evacuation due to a hurricane and more. For reservation made more than 45 days ahead of an Arrival Date, travel insurance must be purchased at the time of the reservation. You have 10 days after the purchase to change your mind, and receive a refund of the premium, as long as the Arrival Date is still more than 45 days away. For reservations made more than 45 days in advance of an Arrival Date, travel insurance cannot be subsequently purchased. If you are making a reservation less than 45 days from your Arrival Date and decide to purchase travel insurance the insurance premium is due with your rental down payment and is not cancel-able nor refundable. Should the Township of South Padre Island issue a Mandatory Evacuation order the Rental Agent is under no obligation to refund any unused portion of the Guests rental fee. For that reason, the Rental Agent strongly encourages the Guest to purchase Travel Insurance. Check-in time is after 4 p.m. on the day of your arrival at the Padre Island Rentals Welcome Center. 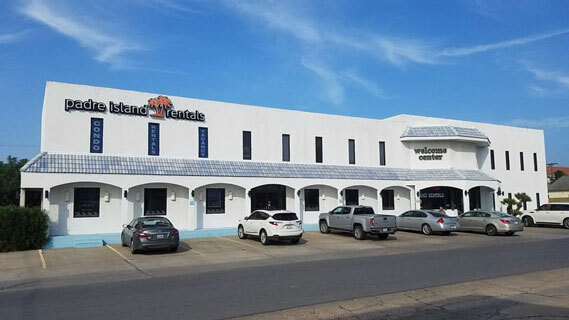 The Padre Island Rentals Welcome Center is located 3100 Padre Blvd., on the corner of Kingfish and Padre Blvd., 1¾ miles north of the bridge on the right hand side of the road, one block north of the IGA (Blue Marlin) Supermarket. Our Front Desk is open 24 hours a day, 7 days a week. Occasional check-in delays may occur during peak seasons. At Check-in we will gladly issue a maximum of four keys per reservation. All keys must be returned to our rental office at Departure. There will be a $30.00 charge for each key not returned. Your property will be cleaned, with fresh linens and beds made before your arrival. You understand that no housekeeping services will be performed during your stay, unless requested. Guest may bring soiled bath towels and bed linens for exchange to the Padre Island Rentals central office. The towel and linen exchange is located on the east side (beach side) of the building, and is open between the hours of 11am and 3pm daily. Towels are exchanged for free. There is a $.50 per sheet fee for linens. Maid services, delivery of fresh linens, or rental equipment such as baby cribs, and high chairs are all available by contacting our 24-hour front desk. Addition fees do apply. Towel and linen delivery can be arranged at our front desk upon arrival or by calling us at 800-926-6926. The towel delivery charge is $15.00. Beds will be made with sheets and pillows. If the property you are renting is equipped with a sofa-sleeper and you plan on using it, please let us know when you check-in. Our reception desk will give you sheets for the sofa-sleeper. Bathrooms are supplied with towels and are ready for your arrival. You will also find a small wrapped bar of hand soap and a wrapped roll of toilet tissue. For information on beach and pool towels see “Items You Might Like to Bring” below. Kitchens are equipped for most standard cooking needs. For cleaning up after meals you will find a 3 oz. bottle of dish washing liquid (refillable at are our central linen exchange), 2 automatic dishwasher tablets (if the property has a dishwasher), a wrapped cello dish sponge or dish rag, plus 1 or 2 tea towels. Other important items you will find in the kitchen include 1 roll of paper towels, coffee filters and 2 plastic trash bags. We hope you don’t need them but you will also find a broom and dustpan, and a sponge mop or equivalent. Some properties also have vacuum cleaners. Beach and pool towels, and all the important items for a day in the sun. See our website for more information on how to best enjoy South Padre Island beaches. The FAQ section of our website answers lots of questions, including more complete information about what to expect as you stay in one of the great properties managed by Padre Island Rentals. Lock all doors and windows. Thank You! We have tried to describe the property and its furnishings as accurately as possible. However, sometimes an owner will remodel or redecorate a property after the information has been published. We also make every effort to keep each property and its equipment in good working order, and to make repairs as soon as possible when we are notified of a problem. No refund, or rate adjustment will be made for mechanical failures, such as air conditioning, television or appliances. When making a reservation you have the option of paying an Accidental Damage Deposit Waiver or paying a full Accidental Damage Deposit. If you choose to pay the full Accidental Damage Deposit, the deposit can be refunded upon departure between the hours of 9 AM and 5 PM after your rental property has been inspected. Please allow us about 1 hour to perform the inspection. If you are unable to wait, or if you checkout before 9 am, our accounting office will mail you the refund check with-in 10 days. Occasionally a property which has been reserved will not be available because of damage to the property, because the property has been sold, or for other reasons beyond control of the Rental Agent. If such an incident occurs the Rental Agent will substitute comparable accommodations and notify you by phone or email of the change. If comparable accommodations are not available, you will have the option of selecting from available properties at the published rate or receiving a complete refund of your reservation advance payment. Some of our properties offer Internet access. Please check the web page of the property that you have rented to verify availability. Some common areas in condominium complexes may offer WiFi access. If you need to bring a pet along, we can assist you in finding a kennel. Select properties allow small dogs, and only by separate arrangement with the Rental Agent. Should we discover a pet in the accommodations, you will be charged a fee for pest control, a deep clean, and an additional day’s rent which, when combined, usually amounts to $500. ALL of our properties are designated as non-smoking accommodations. No smoking is permitted anywhere inside of the homes and condominiums, nor is it permitted on the balcony. Should anyone in your group smoke, please have them do so outside of the property. Again, there is an additional fee of $500 for cleaning and damages for those guests found to have smoked in any of our properties. Although we cannot be held responsible for items left behind, we do make every effort to locate and return forgotten items to you. Please Contact Us to make arrangements for the return of located lost items. There is an additional $25 handling fee, plus shipping cost. This property is privately owned. The Rental Agent reserves the right to refuse service to anyone, and enter to inspect the property at any reasonable time. The Rental Agent will not be responsible for accidents or injuries to Guests for loss of money, jewelry, or valuables of any kind including theft or vandalism of vehicles. Guest agrees to indemnify and hold Owner and Rental Agent harmless from any and all cost, expense, attorney’s fees, liabilities, damages or claims for damages, including but not limited to, those arising out of any injury or death to any persons or loss or damage to any property relating to the rental of the Property. Neither Owner nor Rental Agent shall be liable for any errors of judgment or for any mistake of fact or law or for any loss caused by Owner or Rental Agent’s own negligence, In the event of negligent Guest damages, liability is not limited to the security deposit.